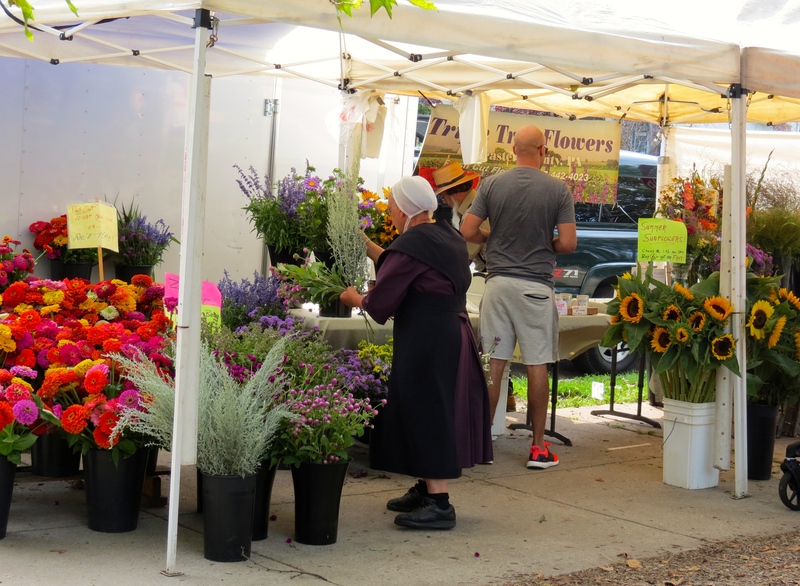 Stepped off the trolley at 43rd Street, which intersects Clark Park, and on Saturday mornings the farmers’ market brings in fresh produce and other products into West Philly. I purchased a bar of lavender soap, which gave my bag a sweet fragrance every time I opened it. We met our leader, Mike Klusek, and fellow photographers at the Green Line Cafe, a neighborhood coffee shop at 43rd and Baltimore Avenue. 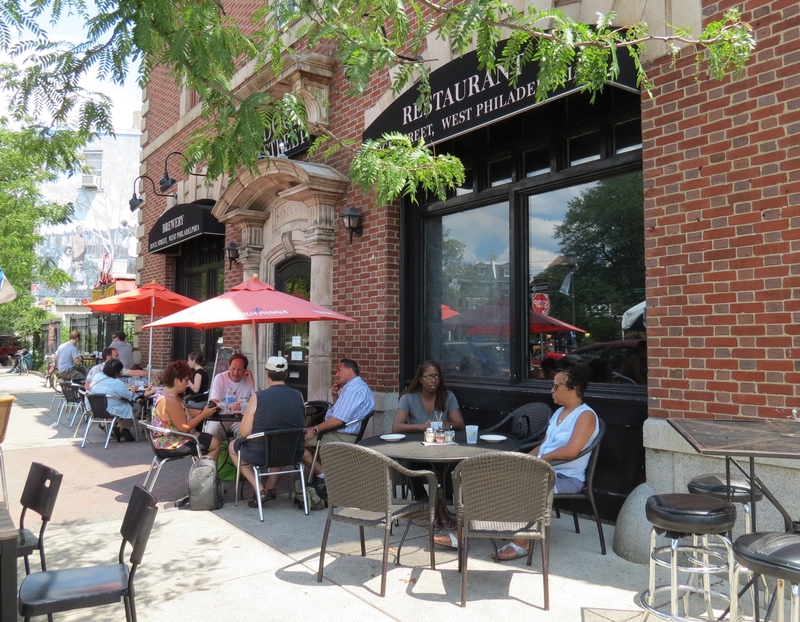 After bulking up with iced coffee before we began our walk on a very warm summer’s day, we strolled along Baltimore and Springfield Avenues into the Squirrel Hill section, just west of Clark Park. The trolley line, constructed in the late 19th century, brought development to the area, and the three-story, two-unit, Queen Anne style Victorian homes characterized many of the neighborhoods. Architectural features, such as gables, dormers, oriels and porches, and painted decorations on the homes give each their unique character. A conical tent, covered with slate shingles, topped the towers and turrets. A photographer could spend a good deal of time taking pictures of the various elements. As an artist, I especially liked the various color schemes and flourishes above the doorways. No wonder these houses have been titled the painted ladies of American architecture. We found other architectural styles. Along the street, a series of brick row homes sported a simpler style, and a magnificent stone building, called “The Castle” wrapped around the corner of Springfield and 46th Street. The temperature climbed to 92 degrees, but a light breeze gave some relief from the heat. Trees shaded the sidewalks, and the colorful crepe myrtles bloomed their festive pinks and purples. Philadelphia calls itself “The City of Arborly Love” and provides a free tree to residents. Residents tend gardens along the front porches giving the passerby a visual delight of color. 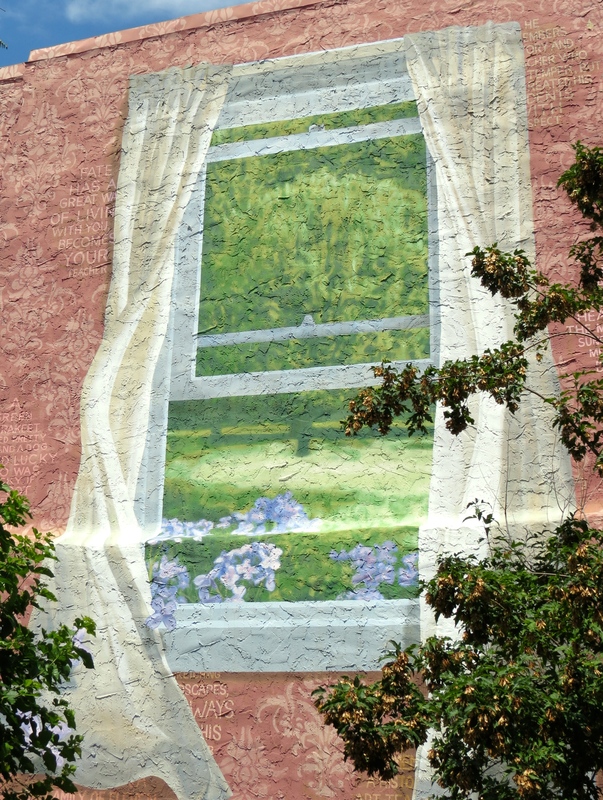 In addition to being a city of trees, Philadelphia is home to more than 3,600 murals. 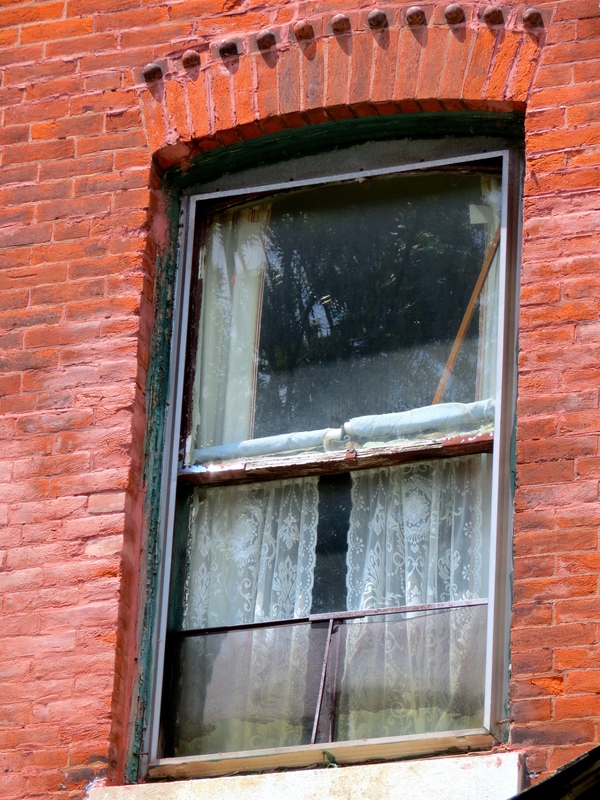 We passed several on our stroll, including this view out a window. Many windows and doors caught out attention . . . including this one with the lacy curtains. 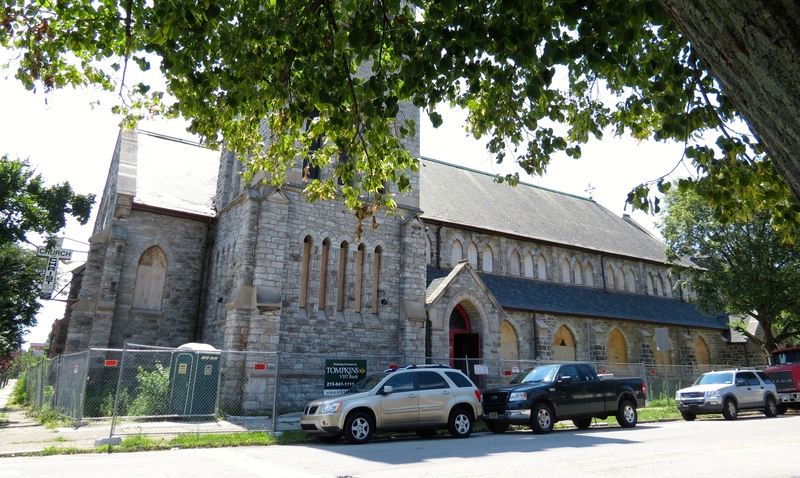 The Community of Squirrel Hill have pulled together to save the church on the corner of 47th and Kingsessing. The church was just a few days from being demolished when local residents stepped in to prevent the church’s demolition. Designed by the architect, Frank Furness, the church had fallen into disrepair but now is under construction to become two schools. Several blocks from this structure, stands one of the most important landmarks in the area, Francis de Sales Roman Catholic Church. Built in 1907 and renovated in 1968, its crowning glory is the tiled Byzantine dome. As I walked into the church a duet practiced at the organ, preparing for a wedding later that afternoon. With the music adding to the experience, a short video captures scenes from the church. We returned to Baltimore Avenue, passing through Cedar Park, pausing to take refreshment at Dock Street and to compare our photo notes. 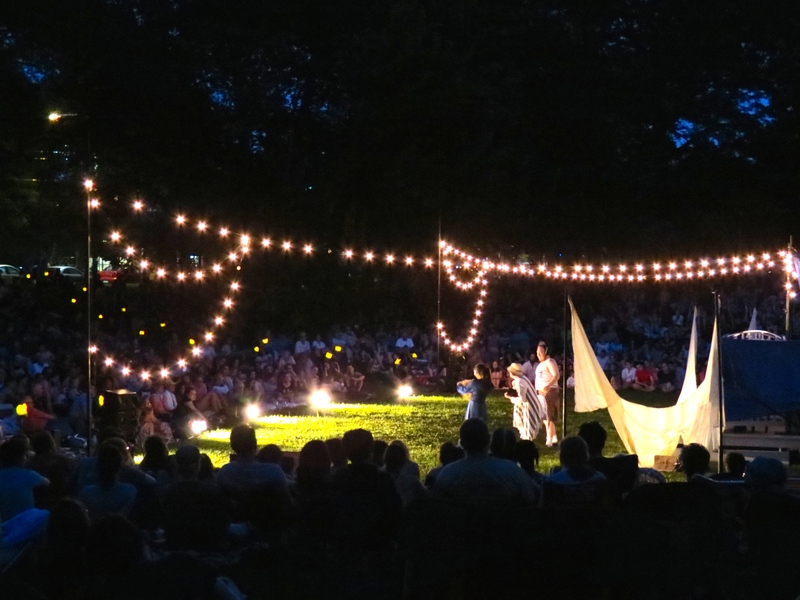 Later in the evening, I returned to Clark Park for their 10th anniversary of Shakespeare productions.The community gathered for the performance of The Winder’s Tale. 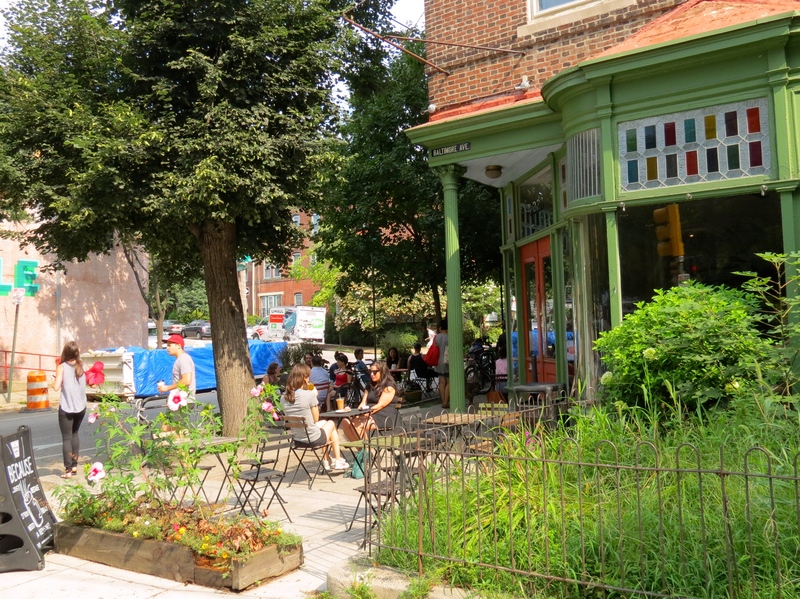 The Squirrel Hill neighborhood is a jewel in the West Philadelphia crown. A visitor is treated to architecture that has survived over a hundred years requiring the residents to spend time and money on maintaining the ornate decorative flourishes on these grand Victorian homes and gardens. These efforts preserve the history of the neighborhood and the common good of the community, while giving the wandering photographer the chance to capture these moments.